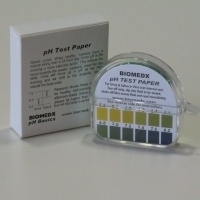 Basic pH test paper for urine and saliva testing. Plastic case with color chart and roll of pH paper in foil wrap for long shelf life. Boxed. Roll is 15’ delivering 90 2” test strips. Range 5.5 to 8 in .2 increments. Tear off a strip from the roll, touch to sample, read immediately. TIP: when testing saliva, once a sample touches the paper, count 1 second and touch the pH test strip to a paper towel or tissue and this will take up any excess sample fluid and it will “lock” in the color. Saliva has CO2 which will off-gas when saliva is exposed to air giving an artificially high pH value if one waits to read the measure. Saliva pH needs to be read immediately once it leaves the mouth whether using pH paper or pH meter.